For Father’s Day 2018, we did a few crafts. Here is one of them. My four year old daughter and her cousin, with the help of their Grandpa and I. 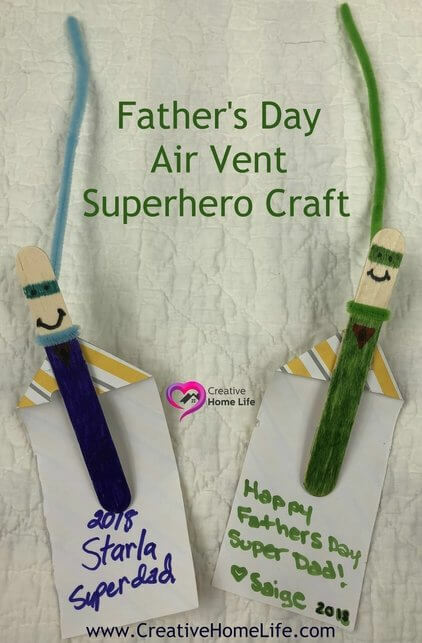 Made these cute little “Air Vent Superhero” Crafts, for their Dad’s! These Superhero’s will stick out of their Dad’s vehicle’s air vents by the pipe cleaners and “fly in place” while they drive. Aren’t they adorable?! The girls are so excited to gift them to the Dad’s! Pick the color of marker to color the superhero. Note: Lighter colors work better (the super emblem and eyes will be seen easier). Draw the line where his body is going to start and let your child fill in under the line with color. If your child is too young to do themselves draw a triangle hero emblem and the mask and face. Cut a cape out of paper of yoyr choice. Fold the top corners down, to form triangles. Attach a pipe cleaner around the craft stick. Where the hero’s neck would be, be twisting around itself, on one end, keep it long so it can be stuck in a vehicle air vent. If you have any questions about our “Air vent Superhero” craft, or anything else… Please feel free to message me or leave a comment.